BHP is weighing up several options in a plan to offload its onshore petroleum assets in the United States. The company, which today released its 2018 financial year first half results, has been under pressure to exit its US shale venture, with investor Elliott Associates repeatedly pushing for the company to divest its assets. Despite initially defying Elliott’s requests, BHP confirmed in August last year that it was exploring options to offload the onshore US assets. “We are preparing all appropriate documentation ahead of data rooms being opened to potential trade sale buyers by the end of the March 2018 quarter,” BHP said. BHP is operating nine rigs at its US shale properties, but could reduce that number as the sale process develops. Its drilling and development expenditure onshore US in the December half was $US336 million ($421.5 million). 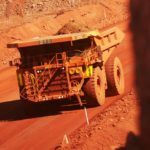 Meanwhile, BHP’s iron ore production during the December 2017 half was on par with same period of 2016 at 117 million tonnes (Mt), or 136Mt on a 100 per cent basis. The company has maintained its iron ore production guidance for the 2018 financial year at between 239–243Mt. BHP has lowered its metallurgical coal production guidance to between 41–43Mt for fiscal 2018, reflecting expected lower volumes at the Broadmeadow and Blackwater sites. Its metallurgical coal output was 4 per cent lower in the December half compared to a year earlier at 20Mt. In Queensland, production was impacted by ongoing challenging roof conditions at Broadmeadow and geotechnical issues following wet weather at Blackwater. BHP’s thermal coal production for the December 2017 half was 4 per cent high against the previous year at 14Mt. In Chile, BHP saw copper production at the Escondida mine increase by 29 per cent to 583,000t, a result which helped lift its overall output of the base metal by 17 per cent to 833,000t. BHP chief executive officer Andrew Mackenzie said strong operating performance in the first half allowed the company to capture the benefit of higher prices. 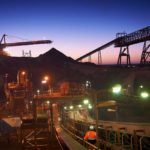 “The successful Los Colorados Extension project ramp-up (at Escondida) contributed to a 17 per cent increase in copper output and production records were achieved at a number of Western Australia iron ore and Queensland coal mines,” Mackenzie said.